It was an honour to present Damjan with his Instructor certificate during the recent CMAS General Assembly and also to thank his mentors for training him to this achieve this goal. Damjan has achieved this grade through massive determination, commitment and dedication to his sport. He has overcome so many difficulties and has done so with a wide circle of very good friends. CMAS has to recognise that he is the first SCI victim to achieve a CMAS Instructor One Star grade. I also know that having achieved this grade Damjan will use it to introduce and train others to be safe in our beautiful underwater world. When and why did you begin to dive? I began to dive because of great desire to get to know the underwater world. I wished to dive long before the injury in 1990 but then because of lack of time and resources I couldn't. What fascinates me about diving is the “weightlessness” of the movement in the water. In 1999, at the Reha Care fair in Dusseldorf I saw a presentation of diving for disabled persons and then my desire for diving rose again. I started a PADI course in Maribor in 2000, but I had to interrupt it because of a surgery. 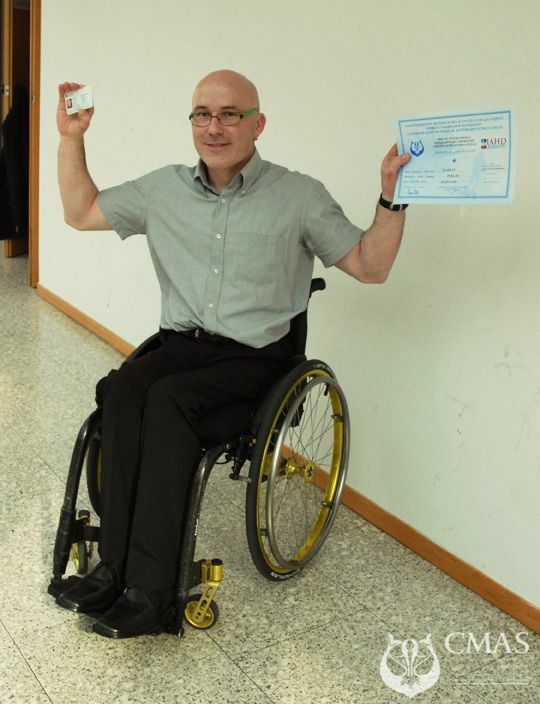 In 2003 I joined the second diving course for people with spinal cord injuries organized by swimming club of Slovenske Konjice which is a co-founder of IAHD Adriatic. What do you like in diving? In course for CMAS one star and other categories I liked the theory, rules and skills you need for safe and good dive. Everything we learned at that time was new and interesting. I like this expertise and knowledge and mastering of the underwater movement. Every dive since then brought me more and more confidence in myself. What does diving contribute to your life? How do you feel yourself underwater? With every dive I see and feel the beauty of the underwater world. Underwater movement is for me a kind of new universe. Diving affects me also in a physiological way as after every dive I almost don't have spasms any more, which often limit my everyday living. What does your great achievement means to you? The acknowledgement of my CMAS one star instructor category means to me a big personal satisfaction. For me and for other disabled divers it also means a confirmation, that with hard and systematic work we can be equal to all recreational divers. The only assistance we need is the help with carrying the equipment to the place of the dive. This licence brings also the responsibility, which, if I tell the truth, also scares me a little bit. My instructor category is not just acknowledgement to me, but to all of us who invested in this our work, time and patience. Can you tell us something about your CMAS one star instructor course? Well it’s funny you would probably expect that we did some extra exercises but I have to disappoint you. I was a member of a group of three candidates together with Alenka Fidler and Matjaz Paj they are both able bodied. Our instructors were Ivica Cukusic and Branko Ravnak and you can believe me they didn’t have no mercy. For me it was fun because I was diving with Alenka and Matjaz for last few years and both of them are excellent divers that know our needs. Theoretical part was most demanded because our instructors insisted that everything should be by the book. Micro lectures were sometimes real nightmare for all of us. All together we have been working for more than six months. Are you aware of the fact that you are first licensed one star instructor with SCI (Spinal Cord Injury) in history of CMAS? Yes I do and you can believe me that this is a great victory for all divers with SCI. You have to know that world of disabled divers is really small. As far as I know beside me at the moment out there is only one person with SCI that is diving instructor. That is Fraser Bathgate from Great Britain but he has different licence, he is not a CMAS Instructor. He is more mobile and he actually doesn’t teach disabled. You want to say that CMAS gave you the opportunity that you can teach equals? That’s exactly what I’m saying. But CMAS didn’t gave that only to me but to all the other disabled divers (among them SCI divers are the most demanded). Ten years ago none of us could imagine that he can become instructor. When I started my CMAS one star course we have been learning together with our instructor Branko Ravnak. He learned from us about our disability and we learned from him everything about diving. Knowledge sharing trough practical experience made us unique. Today we can learn and transfer methods faster than anyone that we know and all we need is minimum assistance of able bodied. How long do you need to finish CMAS one star course for someone with SCI? Today we finish the basic skills in three weeks most of them in the pool after that the candidate is ready to dive in open water. To become complete one star diver he has to dive for at least two years after he finishes his exam. Then he can approach for second star. It is also important that candidate is totally independent which means that he or she has to drive the car. You said “she”, you want to tell us that among SCI divers there are women? Of course there are. We are endangered by female population with SCI. In first group back in 2002 there was Barbara (she just became mother of a son few weeks ago). She was the first woman with SCI that started diving all around. She was diving on wrecks (Peltastis, Taranto) and elsewhere and she is the first that she reached the depth limit in diving with compressed air. Today we have three girls from Croatia and Slovenia that are capable to dive with compressed air in almost all conditions. What conditions you have in mind? We don’t have money to go to Bonaire or to other fancy destinations with warm water like HSA and other disabled divers does. We dive mostly in Adriatic Sea which is most of the time unfriendly (cold water, wind …). Anyway we deal with that and we dive normally from March until November. We use wet suits made by measure and other standard equipment which allows us to dive to 40 meters inside safety curve. Ten years ago they said to us that we can dive in warm environment and only to 15 meters. When we asked why no one could explain. Since 2002 we collect data and carefully observe everything and that is how we reach the maximum depth for compressed air. In 2007 prof. Dujic with his group made with us a study: “Venus gas bubble formation and decompression risk after scuba diving in persons with chronic spinal cord injury and able bodied controls”. In that study they proved that diving with compressed air is not less dangerous for individuals with SCI than to other able bodied divers. That was first great victory. What was the second one? Without doubt being a member of CMAS family. Further on the fact that we expand our activities trough Adriatic region and that we survived in those messy times. Today we have excellent SCI divers in Slovenia, Croatia and Serbia. They are composing the network which guaranties that activities won’t stop. We are proud on our research work and appearance on EUBS and other scientific events worldwide. I have to mention that everything wouldn’t be realized without a team of our able bodied friends and mentors from all over the world. First of all there is IAHD Advisory board that is supporting and supervising our activities. Great names like prof. Gosovic, prof. Sagalevich, prof. Dujic, Dr. Denoble and Msc. Hocevar are guarantee that our work is honest and correct. Followed by president of CMAS Mr. Ferrero and president of CMAS TC, Mr. O’Shaughnessy, both of them trust us and in the end approved my certification which made my burdon even bigger. In the end all my friends handicapped and able bodied from Adriatic region which are expecting that we won’t stop and that after me there will be more disabled divers and instructors. What is your message to other disabled people and to the diver society? Everyone who is not afraid of the water or closed spaces should at least once in his life try to peak in the underwater world and take a “walk” in a different way.